The next area we move onto in our Style Breakdown series is Naples – which might have more high-end bespoke tailors than anywhere else in the world. Neapolitan tailoring is known for its soft jackets, with light shoulder padding and chest canvas, both making them more suitable for the warmth of southern Italy. But the style has also become popular globally in recent years, as dress codes have relaxed and men seek a bespoke jacket that is casual enough to wear with chinos, even jeans. It’s fair to say that this characterisation of the style applies to most Neapolitan tailors. However, there is also more local variation than many realise, and in the next five pieces in this series we will illustrate and analyse this. 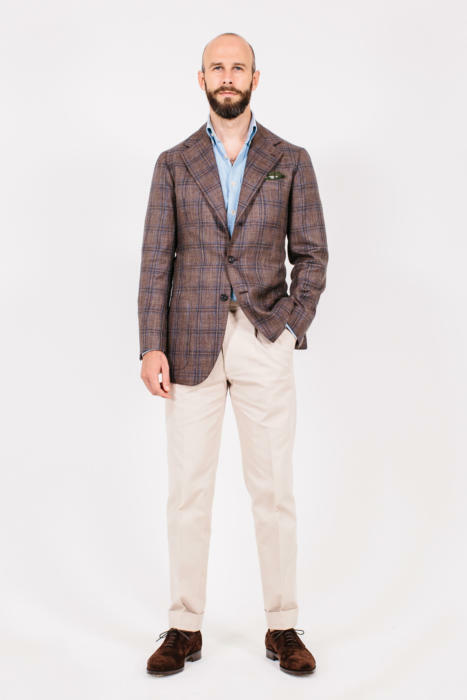 We start with Sartoria Solito, which offers what many will think of as the standard, modern Neapolitan jacket. This summer jacket was cut for me by Luigi Solito in 2017. It was my fourth jacket from Solito, with the first being cut by Luigi’s father Gennaro, and occasional involvement from Gennaro in subsequent commissions. It is a wool/silk/linen mix, which is my favourite material for casual summer jackets. 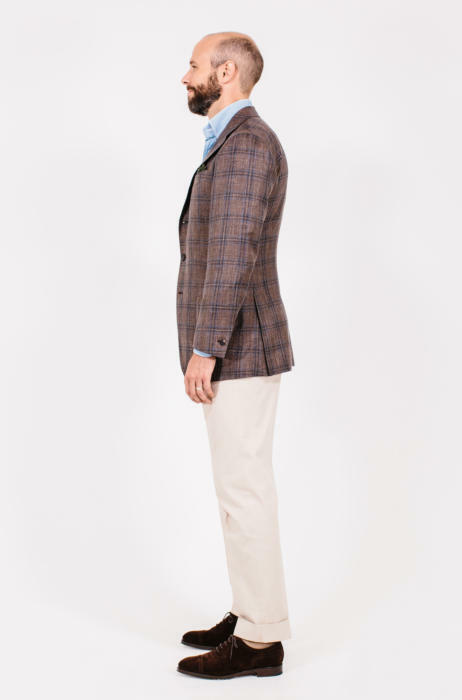 The wool gives the jacket body and crease resistance, while the silk and linen keep it light and breathable. The colour and pattern, too, have made this jacket a favourite because they combine to make something very versatile. 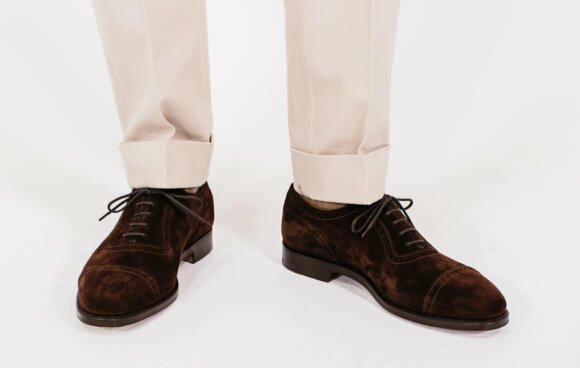 The brown can go with almost any colour of trouser, from cream to green to charcoal, while the muted check is helpful to differentiate top and bottom halves, without being too loud or showy. Going back to the style, the most important things that make this a casual jacket, and therefore most suited to jeans or chinos, are the small, natural shoulder and the short, open bottom half. So the shoulder is relatively narrow, 5¾ inches along the shoulder seam; it is only lightly padded, which keeps it close to my actual shoulder; and it then runs naturally down into the upper arm, without the interruption of any roping in the sleevehead. The result is that the jacket looks like it’s following the lines of the body rather than imposing anything on it, and is almost more like a sweater than a jacket in this respect. In the bottom half, the jacket is a little shorter than most (30½ inches) and the line below the fastened waist button is quite curved. If you follow that line from the waist button downwards, it is relatively straight at the start (straighter than someone like Liverano for instance) but then curves away sharply at the bottom. Jackets that are shorter, rounded and more open like this will feel more casual. However, this can be taken too far. Many younger Neapolitan tailors produce jackets with stunted bottom halves and very high waists, which are not flattering at all. Indeed, Luigi naturally cuts a slightly shorter jacket, but I wanted it at this length. So always be aware of the risk here. The seat of the trousers should always be covered – as it is, just about, here. 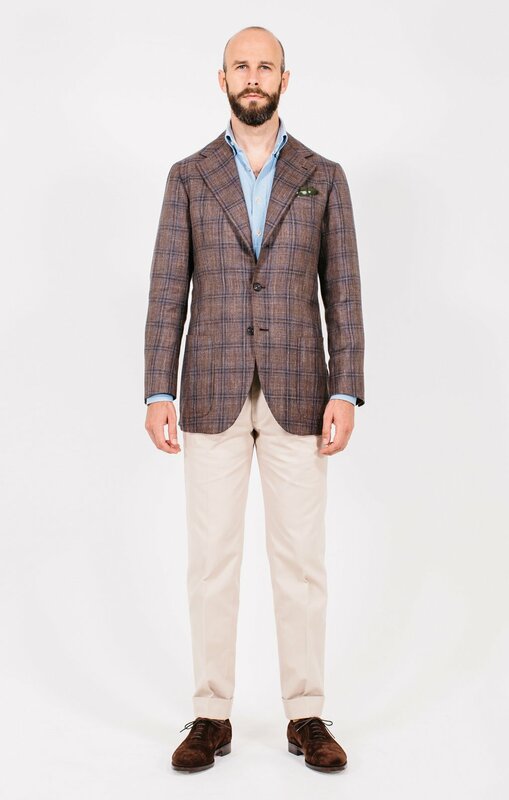 What else makes this a typical modern Neapolitan jacket? Well, the lapel is quite wide (4 inches), which enhances the rounded shape of that front edge. And other things are rounded too, including the shape of the patch pockets and the ‘barchetta’ or ‘little boat’ shape of the breast pocket. The gorge (the notch shape where the lapel and collar meet) is also quite high – 3¼ inches from the shoulder seam. This is a modern trend and something I might ideally have differently on this jacket. Closer to 4 inches might be better. The sleeve is also tapered sharply towards the cuff. Despite starting at a fairly standard width at the top, it narrows to the point where a double-cuffed shirt would not be able to fit in the opening. Overly narrow sleeves is also a trait of some younger Neapolitan tailors, and is worth avoiding. Tight sleeves only make it look as if your jacket doesn’t fit. They don’t make you look more muscly. There is a slight angle to the balance of this jacket, with the front a little longer than the back. But this is not a feature of Neapolitan jackets. Many English do it too, as you can see in other posts in this series, such as my linen Anderson & Sheppard. It’s just often more noticeable with Neapolitans because the jackets are shorter. Elsewhere, the chest of this jacket is cut quite close with no drape; the back is relatively suppressed through the waist; and the breast pocket is a touch higher than other tailors, reflecting the shorter length and higher gorge. All are typical of this general Neapolitan style. We will see in future editions of this series how an older generation of Neapolitan tailors cut things rather bigger, though still soft. This is closer to the English tailors that inspired them in terms of cut, therefore, just not in structure. 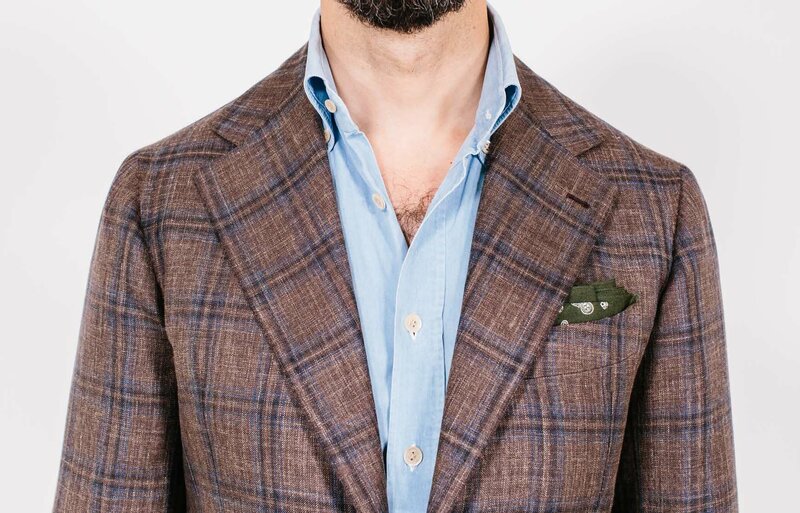 Meanwhile, in the image above you can see that natural line to the shoulder of this Solito, as well as the Everyday Denim shirt and green-cotton handkerchief (from Anderson & Sheppard) it is worn with. The trousers in a stiff cream cotton were not made by Solito, but by fellow Neapolitan Dalcuore. Their narrowness and deep 5cm cuffs are typical of most Neapolitans too, however. The shoes are from Edward Green, a cap-toe oxford style they call Canterbury, made in dark-brown suede. You can follow the discussion on Solito summer jacket: Style breakdown by entering your email address in the box below. You will then receive an email every time a new comment is added. These will also contain a link to a page where you can stop the alerts, and remove all of your related data from the site. Love this jacket, Simon. Coincidentally, before you first posted pictures of this jacket, I tried to have a jacket made in the same cloth, but it was out of stock. I hope to be able to find something similar for this spring /summer. In the meantime, I have a sort of autumn/winter version, though somewhat darker, also in a Caccioppoli cloth. I like the cut of the trousers, too. The narrowness works well with the cut of the jacket. How much does Dalcuore charge for trousers? Thanks, Simon. I’ve been meaning to talk t the guys at Thom Sweeney. I’ll make a post of doing so in the new year. Thanks for this enjoyable post on Christmas Eve. Merry Christmas to you and your family. 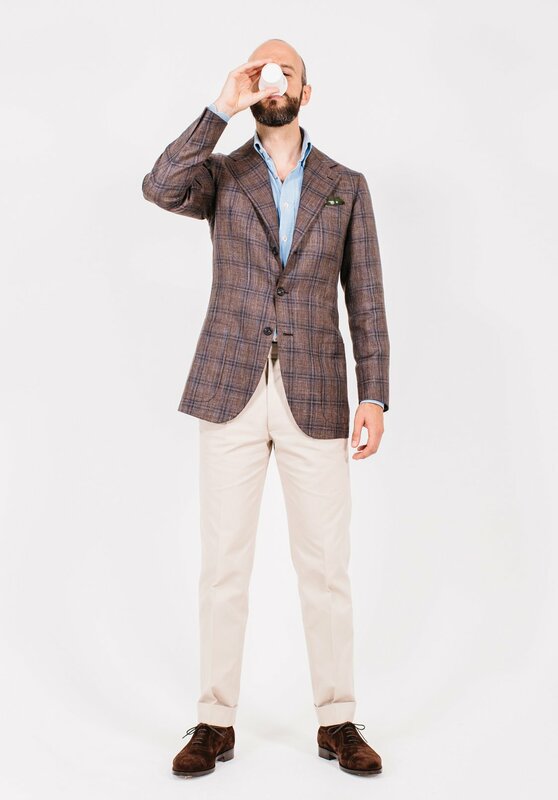 Do you intend to review the jacket and trousers which Thom Sweeney made for you as part of this series? Also, if I recall correctly, your suede jacket from Cifonelli also has soft Neapolitan like shoulders? Do you intend to review that (or anything by Cifonelli) as part of this series? No, I wasn’t planning to do the Thom Sweeney, just because it was a long time ago and I think the style has changed a little since then. The suede Cifonelli didn’t really have Neapolitan shoulders – the padding was the same, and the width, it was just that the sleevehead was taken out so it ran down very naturally into the arm. Hi Simon. Could you elaborate on the differences between Thom Sweeney’s soft jacket style and the Neapolitans? I have seen some examples and the main difference I notice vs. my Solito is that Thom Sweeney cuts the lapel with a definitive belly as opposed to it being straight. 1. How does gorge height affect appearance? Is it that the longer and more verticle (to keep the width the same) lapel line contributes to impression of height? 2. You write, “Well, the lapel is quite wide (4 inches), which enhances the rounded shape of that front edge.” I assume you mean the curved bottom of edge? And does it enhance it because of a more angled lapel edge that is reflected in the more angled part of the bottom curve? Thanks for helping me understand these subtle points. Thanks. So if the impact of gorge height has minimal impact on how one’s physical proportions appear, is choice of gorge height mostly just about style/aesthetic preference? Out of interest, how much did you ask Luigi to lower the back by, 1cm? Could you provide cloth details of your cream cotton Dalcuore trousers? On the general point of soft shoulders you think this is necessary the best form given that tailoring is really to disguise and enhance the wearer’s body shape ? Furthermore , I’ve found it very tricky to buy RTW soft tailoring and the shoulder often looks too short or too big . Though this is probably why it’s best to go MTM or Bespoke ! Good point – it depends how much of a priority that is for you. A soft bespoke jacket will still be a lot more flattering that non-tailoring, and actually probably than more structured RTW, given the difference of a bespoke cut, but yes it will never disguise as much as structured bespoke. Lovely jacket and fabric. Is the fabric from Cacciopoli? Thanks for the post. I have been trying to get a similar fabric but to no avail. Any recommendations Simon? Merry Xmas! I haven’t seen one recently, I have to say. Sorry. The fabric is gorgeous. My initial reaction is that the lapels are too wide for my taste, but I like variety in what I wear so it would be interesting to have a piece with wide lapels. For your bespoke jackets, do you typically have them made with “surgeon sleeves”? Some Neoplitans will do the top button (closest to shoulder) in a non-working fashion to allow the customer to remove the button if they want to lengthen the sleeve if they pass it down (remove from top, move to bottom). Clearly shortening the sleeves is more problematic, so best to raise a son with equally long or longer arms….at least this was the story I heard, maybe a cover for short cutting the work to sew a working button hole. I think you mean “surgeon cuffs”. Hi Simon. I discovered Solito through your blog and commissioned a navy hopsack blazer. Coming along nicely. I find the style very appealing. Having some English suits I think the Italian style suits me better because I have broad chest and shoulders. The English cut can over emphasize that area while the Neapolitan makes the whole look more balanced I think. Does this mean I should focus on Neapolitan commissions going forward or there is always room for English style garments in a complete wardrobe on the basis of formality? Happy holidays and keep up the great work. Nice to know, thanks Fidelio. I recently received my Solito navy hopsack blazer and it is wonderful. Definitely the most comfortable jacket I own despite creating a nice silhouette and waist suppression. Perhaps it would be relevant to hear your comments about comfort as another dimension in your review of the different styles. For me at least it will become a must have in future commissions from any tailor. I am curious for example about how comfortable is your Liverano jacket, having read your review and your comment about the high armholes catching you. By the way I also received my Bridge Coat, what an excellent product. You get the sense you are wearing something special and different. Keep them coming. Nice point about comfort, yes I’ll include that. Your feedback on the Solito is interesting because generally I find Neapolitans like Luigi a little close in fit, so not always the most comfortable (compared to say A&S or Panico). And very pleased you love the trench coat, that means a lot! It might be the lightness of the construction -which is new to me- and the weight of the hopsack but I find it quite enjoyable to wear. Can you comment on your Liverano from that perspective? I am tempted to try it. It is my understanding that Gennaro cuts a fuller jacket than Luigi. Do you think it would be worth getting a fuller cut from this house? Thank you Simon for the info. As you always say, let the tailor cut the house style. I just commissioned a jacket with Luigi on his trunk show in Miami, Florida. He’s a great fellow and we talked about the jackets he has made for you in the past. I look forward to seeing how this style compares to other Neapolitan tailoring houses in future posts. Very nice! A Happy New Year to you. The neapolitan cut at its best, this. Re sleeve width, proportionality to the rest of the outfit (width of trousers and torso from front/back or side) is key. So it makes sense to narrow the sleeves as the body of the jacket hugs the body more tightly. Obviously, if at any point the jacket follows the outline of one’s triceps—i.e. if one is visibly muscly—it’s too tight. And considerations shouldn’t be limited to when the arms hang at one’s side. I can see the sleeves on this jacket being tapered another eighth of an inch unless doing so impedes movement. You’ve had a number of jackets made by Solito, but never a suit or any odd trousers, unless I’m mistaken. I’ve just worked my way down your excellent tailor styles series for the first time. What a great read! 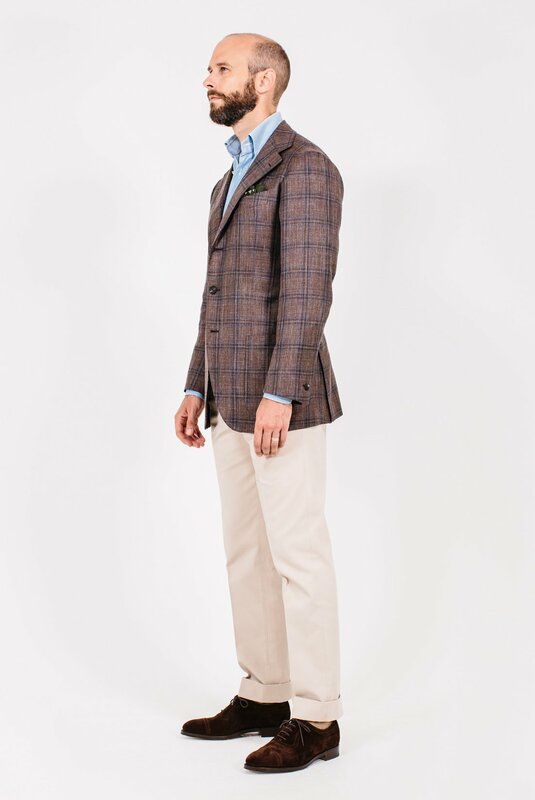 With fascination, I noted that it was not until I reached the Italian makers that I for the first time thought the garments really looked good on you (with this Solito jacket coming close to perfection in my opinion). Forgive me if that sounds harsh, I don’t mean to offend in any way and I do have a point to make! It is only when I read this article series that I realized that all the menswear enthusiasts I follow on social media almost exclusively wear suits and jackets of Italian make. Doubtlessly this constant bombardment of what is the “right” look has skewed my views of what is a proper fit and style. However, I feel that most, if not all, of the English suits and jackets in this series look almost gimmicky. 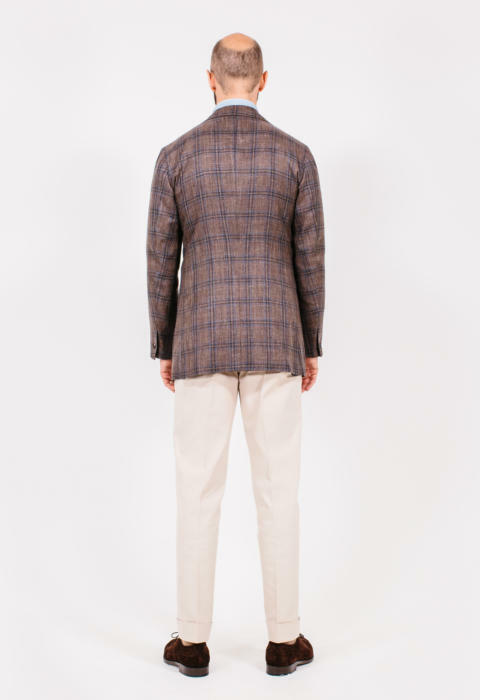 Obviously there is no such thing as objectiveness in tailoring, but when I try to methodically break down what I am seeing in the photos in the articles, I feel that the Italian pieces have been more expertly made to fit and flatter you. They look modern while maintaining the timelessness of a garment that has been made to fit the wearer’s body perfectly, emphasizing and suppressing the physical features of the wearer where needed. The English (and indeed the Camps de Luca as well) jackets all look overly dramatic and stylized, with their often wide, structured and roped shoulders, full bodies and roomy arms. Paired with the very wide trousers, they almost look dated. They are head-turners in the way a costume is a head-turner, not in the way a truly excellent suit is a head-turner, if you know what I mean? There are some great points made in the comments on those posts, highlighting the issues (especially on the Henry Poole DB, which, forgive me, looks rather dreadful). How do you feel about this? Are my points valid or have I just seen too much Liverano and Attolini in my Instagram feed? Would you say that you are you moving more towards Italian cuts, or do you feel that the English ones still hold up? I think what you say is valid, but that it’s very cultural and depends on trends. Bigger shoulders look too much at the moment when everyone’s in T-shirts, but when the 80s or Mad Men comes around again, it won’t look so. Also, it depends on situation. I’d still want an English suit for something formal or extra smart. And I feel the English ones still do very well there. But I probably dress like that once a week, so that’s the limitation. Very insightful comments Alex! So far, my favorite garments in this series have been the Solito and Caraceni ones, both look fantastic. Simon has also done articles on other Italian tailors such as Zizolfi and Caliendo that are very helpful. The Caliendo and Zizolfi garments are beautiful and the fit on him looks to be exceptional. I don’t know about you, but I’m certainly moving in the Italian direction, in large part due to Permanent Style. Simon, this jacket is superb! I’ve read all of the articles in this series and have enjoyed them tremendously. So far, the top three styles that I prefer are Solito, Caraceni, and A&S, thus giving a slight edge to the Italians. For some reason I find the Caraceni style particularly interesting, but all three are outstanding. This series is some of your best work and I’m looking forward to all of the future articles. Is there any cotton like that (the one of your trousers) in the Caccioppoli range? It’s Caccioppoli, but a seasonal fabric so not available anymore. However, there was a very similar brown listed in our recent post on my favourite seasonal cloths – 390135, here. The fabric is darker than it looks in that swatch image.